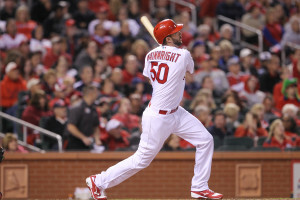 Adam Wainwright doubled, then hit a three-run homer to jump start the offense and support his first win of the 2016 season with a 10-3 final over the Phillies. He had that bases-clearing triple in Arizona last Wednesday Then put one in the third-deck off Jeremy Hellickson. “Every time I’ve come to the plate since I was 8 years old, I’ve dreamed about hitting a ball like that,” Wainwright said. What the Cardinals need is for Wainwright to pitch. He got his ERA under seven but allowed three runs on five hits in six innings. He fell behind 3-0. The Cardinals have hit 40 home runs, the most in the majors.